We offer two different types of flight for visitors and gift vouchers are available for both. Our qualified pilots can give you a glider experience flight in one of our two seater aircraft. You will be able to enjoy the local sights and experience the thrill of silently soaring over the Warwickshire countryside. Our qualified instructors give you a glider flying lesson in one of our two seater, dual control gliders, and they will offer you every opportunity to handle the controls once the glider is airborne. 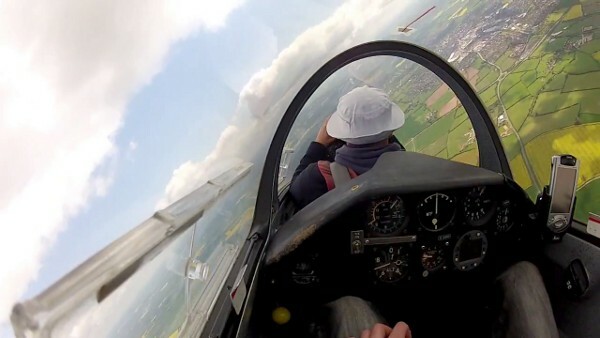 Purchase an Experience Flight in a glider at Stratford on Avon Gliding Club with PayPal. Purchase a Trial Lesson in a glider at Stratford on Avon Gliding Club with PayPal. The vouchers are similar to greetings cards, and are intended as presents for family and friends. They open up like a greetings card, have space inside for a personal message, and have advice on the back about how to contact us, find our airfield, and what to wear. If you’d like to give somebody a Gliding Gift Voucher, you can select and buy one online via Paypal from the options at the bottom of this page. There will be a full briefing on safety, how we control the glider, and what to expect during the flights. The duration of each flight depends entirely on the conditions of the day and, because of the uncertainties of the weather, we cannot guarantee flight times. However there is no time limit for using the voucher, so it can be kept it until fine weather when the chance of a thermal soaring flight is better. In that event each flight may last a maximum of 20 minutes in the air. After landing there will be a debrief, we will record the flight details on a logsheet and starting the following day you will be entitled to a 28 day membership of our club. You may then return, if you wish, and take more flights at club rates, under the same system as all other club members. We fly all year round when conditions are suitable. We can usually welcome visitors at weekends, and we are also usually open on Tuesdays and Thursdays between April and October. We run an online booking system, so you can book your preferred day and timeslot. You will need to phone again on the day of your flight between 9 am and 10 am to confirm your booking and check that conditions are suitable for flying visitors. Full instructions are included in the voucher pack. There are some constraints on the age, size, and health of the people we can fly with. The only considerations are for your safety and the safety of your instructor. If any of these apply to the person you are buying the voucher for, please read the relevant information. Cameras: if you want to take pictures during the Glider Experience flight then this is usually possible provided that the camera has a strap so that it can be securely attached to you and it cannot be dropped inside the glider while you are flying (so no mobile phone cameras). If you are in any doubt about any of the above information, please contact Ian Kennedy by email.